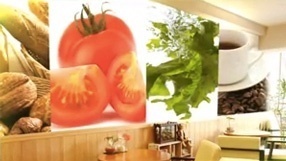 High image representation expands possibilities for signage printing. A water-based Mimaki latex ink has been developed by concentrating Mimaki’s technologies, without losing the vibrant color and high color reproducibility of solvent inks. Resins contained in the latex ink are dissolved by heat and form a membrane to firmly fix pigments to the surface of the media. The latex ink allows for printing on a wide range of materials including PVC, paper, fabric, and PET film without the ink absorbing layer, which is typically difficult to print on with solvent ink. Eco-conscious low VOC* formulation latex ink does not require special ventilation in the workplace; therefore, it reduces any adverse operator health effects. Latex ink [LX101] gained the "GREENGUARD Gold" certification by UL LLC of third-party institution of safety science of the United States. Unlike solvent inks, the latex ink has low-VOC emissions. Pigments are dissolved by resins in water instead of solvents. The odor is remarkably reduced. No special ventilation is required for installing the printer. The latex ink contributes to a reduced effect on health and improvement in the work environment. Prints are perfect for indoor displays in restaurants, hospitals, and day-care centers. 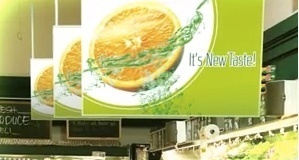 Low-odor latex ink prints are ideal for indoor signage in grocery stores and restaurants where odor is a concern. High-quality image prints and media compatibility meet a wide range of applications. Reusable eco-cartridges contribute to a reduction in total ink costs! The latex ink is packed in a pouch. There is no need to replace the cartridge each time; only a new ink pack is needed for ink replacement. Ink cures at a low temperature of approximately 60 °C! This allows for printing on diverse media. In addition to the original high media compatibility of the latex ink, the low ink fixation temperature allows for latex ink to print on a wider range of media including heat-sensitive materials such as PET and ultrathin materials. Thanks to high ink dryability, the latex ink dries in a second! Solvent ink takes a whole day to dry. Post processes, such as laminating, can be immediately started after printing; therefore, production efficiency is dramatically improved. Moreover, built-in 3-way intelligent heaters accelerate drying, fixation of the ink, and color reproduction. The latex ink has a performance comparable with solvent ink for preferable prints for signage displays including characters, illustrations, photographs, and background color gradation printing. Additionally, latex has a glossiness equivalent to the solvent, and has outdoor weatherability that is crucial for outdoor signage. The world first white latex ink! 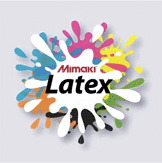 Mimaki is the first company that has succeeded in the development of white latex ink. White latex ink expands the possibility of indoor/outdoor signage designs. White ink is not only used as a spot color but also for underlayer printing on transparent, colored, or embossed materials. Latex ink [LX101] gained the "GREENGUARD Gold" certification. On this web page, “Better work environment” and “Less health effects” are mentioned. However, these are comparative results between Mimaki solvent ink and Mimaki latex ink. Mimaki provides no guarantee concerning the content of this web page.